After completing his gorgeous 30 foot high treehouse, Ethan Schussler scoffed at the idea of having to climb up and down a giant ladder all day. 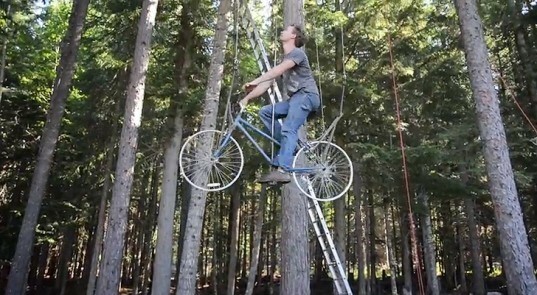 Rather than abandoned his tree top escape, the designer put an old bicycle to the test. 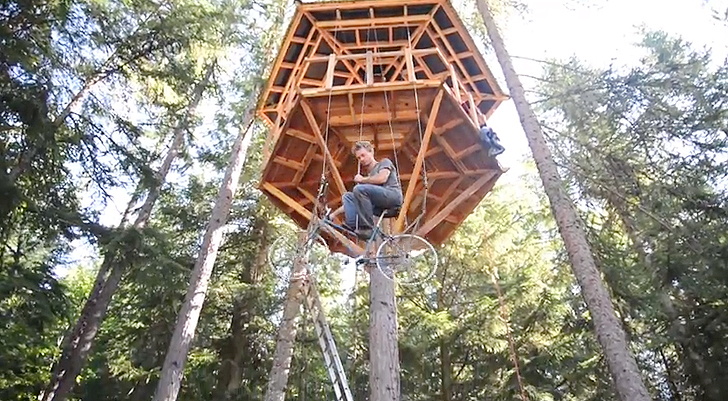 Customizing it to move along a giant chain, Schussler transformed the bike into a personal elevator, which slowly rises to the treehouse’s entrance by pedaling. Lugging a thirty foot ladder to the forest is an annoyance on its own, not to mention having to climb up and down the endless rungs anytime something is needed from the forest floor. Schussler’s solution not only gets him quickly into his treehouse perch, but also recycles an old bike that was laying around. The pedal powered elevator started out as an old twenty speed bicycle. Schussler adjusted the bike’s gears by switching sprockets from the front wheel to the back, which gave enough tension to make a gear slow enough for hauling his own body weight up to the treehouse effectively. Anchored on the ground with a chain, the elevator is used by simply mounting the bike and pedaling. As the pedals turn, the user is lifted into air as if in flight. Once Schussler reaches the top, he can easily climb over the wooden guard into his treehouse hideaway, hooking the back along the side to hold tight until he’s ready to come down. Getting back down is the easy part, with the gear tension tweaked so a slow, smooth descent makes for a safe return to the ground.